We are currently offering a limited number of companies the opportunity to license our Polydi™ design. Our Patented dice are very unique in the fact that they have a special location for graphic illustration (top or bottom semi-round section) AND they will also fall in a random sequence onto the triangular sides which is appropriate for gaming. Our invention is changing the visual appearance of dice games. If you are interested in manufacturing, distributing, marketing, or selling product in the shape of Polydi™, please contact us to discuss licensing or distribution opportunities. Our unique dice design is perfect for novelty toy designers and large scale toy manufacturers that wish to add graphics to dice being used for board games, collectible card games, or any other game requiring dice. 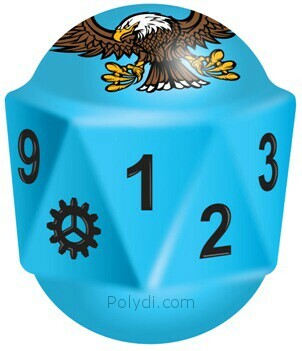 The games that we currently manufacture such as Polydi Brawler and Polydi 2000 utilize a Polydi that is specifically designed with 9 numbers and 3 symbols (12 random roll locations; D12 dice). However, we can produce 12 numbers (with no symbols if you prefer). Private label toy manufacturing for toy stores is also a possibility for qualified retailers.